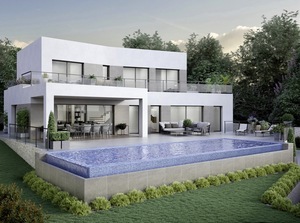 If you are interested in buying a new property in the southeast of Spain, our real estate agency recommends that you come to see our new build villas for sale in Moraira. We can guarantee that you will find authentic real estate that offers living areas adapted to the new times. Our villas have been offered so that the owners of the house can welcome a house with large dimensions. Thanks to having plenty of space for their coexistence, each of your family members can fully enjoy their new property. Spanish Property Sales refers, for example, to enjoying incredible views or enjoying the Moraira climate in one of the private pools. Some of them have lights to illuminate the pool at night. In this way, between the lighting of the home and the exterior areas thereof, your villa will be a very beautiful home. Where are you our new build villas for sale in Moraira? Our new build villas for sale in Moraira are located north of the province of Alicante (Spain). Moraira has a Mediterranean coast that bathes the entire city, offering a charming tourist landscape. In Moraira you can enjoy a great annual weather (as we have indicated above), beautiful beaches with crystal clear water and fine sand, etc. This city is very historical and offers monuments to stop and soak up its history. Moraira is a fishing town, so if you love fish here try the best marine species of the area. And you can do it in fantastic restaurants with sea views. A privilege for the residents of Moraira. Do you want to become one of them? Trusts our new construction villas in Moraira. Get in touch with the real estate agents that make up Spanish Property Sales and let them help you search for one of our new build villas for sale in Moraira.